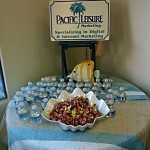 Pacific Leisure participated in the Grover Beach Walk Celebration. There was a huge crown of local residents that enjoyed in the Beach Walk Celebration tonight. Pacific Leisure provided Digital Signs for Forde Properties, Elder Care Residential Services, JitterBug the Simple Cell Phone and Patient Advocate this evening.